One of the most sought after topographical maps produced by the U.S. Geological Survey. The 1900 edition of the U.S.G.S. 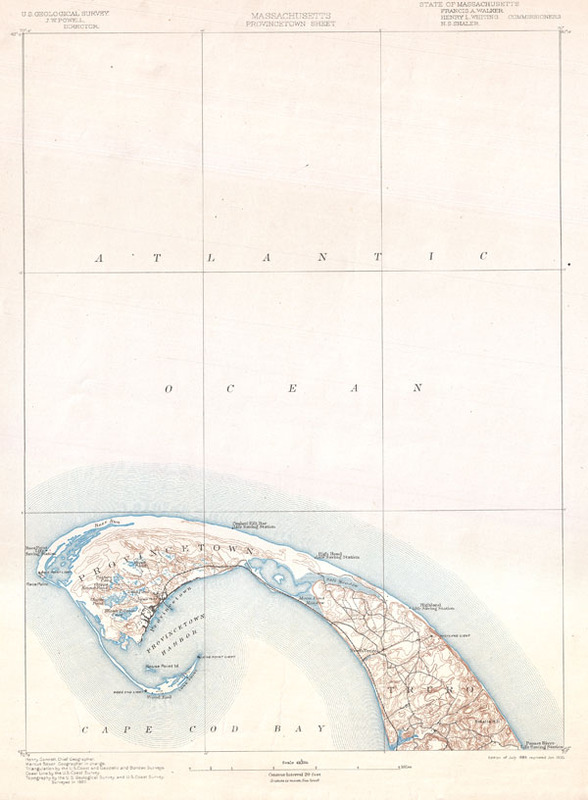 Survey Map of Provincetown covers the norther tip of Cape Cod. Shows Provincetown itself with detail to the level of individual buildings. Identifies topographical features such as Smalls Hill, Moon Pond Meadow, Town Hill, the Great Pond, Shank Painter Pond, Clapps Round pond, and others. Also notes the various roads traversing the region and the railroad. Identifies the Highland Lighthouse, the Race Point Lighthouse, the Wood End Light House, and the Long Point Light House. Also notes the Peaked Hill Bar, High Head, Highland, Pamet River, Race Point and Wood End 'Life Saving Stations.' Prepared by Henry Gannett and Marcus Baker in 1889. Very good condition. Blank on verso. The diagonal streaks across the top of the map are a scan error and are not reflected on the actual map. Rumsey 2883.051. Phillips (Atlases) 1801. LeGear, Clara Elgi, United States Atlases, L1552.